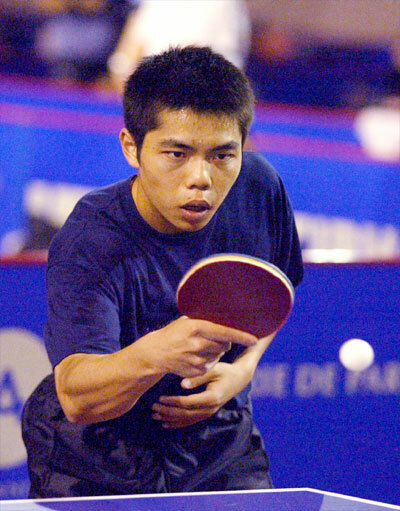 The Men's Singles is the most fiercely contested event at the Worlds. For the 7 Chinese players to break out, they have to win some tough battles. We are concerned about how the two top Chinese players, Ma Lin and Wang Liqin, prepare for the Worlds. During a training break, Cai Zhenhua spoke about the two players. "Ma is in the bottom half of the draw. Barring accidents, he will face Chuan Chih-Yuan in the round of 8. Taipei's Chuan is an example of the new breed of players. He has experience playing in China and in Europe, so he has the Chinese speed, and the backhand attacking capability of the Europeans. Ma Lin lost to Chuan twice, and Chuan's style does limit Ma's in that Ma could not achieve the 3rd ball advantage. In rallies, Ma had a relatively weaker backhand. Because Chuan has played in China, he is familiar with the penholder style, and understands the weaknesses of the penholder style. So this makes it harder for Ma, who now has to get rid of the mental baggage from the two losses. After all, we have been focusing our training on those problems. Technically, Ma has to contain Chuan's speed and agressiveness in the first three balls. "Wang Liqin's mental state is normal now, but it was not particularly good during the later stages of training. He is making step-by-step adjustments. We all know that Wang has the ability, but that it is hard for him to play up to that ability. This makes it harder to predict his results. We have worked the most with him. The 11-point format has the biggest impact on him, and it is the most severe test for him." On Qiu Yike vs Boll, Cai said, "I don't look at this match as an important one. Qiu's ranking is much lower, and it is normal to face a top player early. Perhaps it is a good thing to play Boll early". As the first player from Sichuan to play in the Worlds in the last 14 years, as well as the youngest player on the team, Qiu shoulders quite a bit of responsibility. "Don't give Qiu any more pressure", his coach Liu Guoliang said. "This time he is coming for the experience. The important thing is to play up to his level. He is young, and has a long career ahead". "The guys on our team did something interesting. Even though they had their hair cut in Zhengding, they felt that they did not look tough enough. After we got to Mondville, they cut their hair again. Ma Lin and Liu Guoliang now look like Liu Guoliang in Osaka: maybe only about an inch of hair on their heads. Tang Peng had a new haircut that looks more normal. Liu Guozheng also has a new look. I hope that the 17-Euro haircuts will bring them good luck. None of the girls had a haircut yet, but Guo Yan may want to have a trim." In Cai Zhenhua's eyes, Boll is the biggest opponent. ITTF President said that Boll is Waldner's successor. When we asked Boll yesterday how he would describe himself, he said, "I am under the magnifying glass". "Do you know Qiu Yike", I asked. This question made Boll stop his walk and talk to me. "Before today, I don't really know him. There are too many excellent Chinese players. But before you, there was another Chinese reporter who asked me the same question. I know that I will face this player in the tournament", Boll replied. "I know that this Chinese player will try his best to stop you from advancing. Do you understand his strengths?" "Yes, I know that every Chinese player wants to beat me. I will do my best to gain the upper hand against the best players in the world", Boll said. Boll's idol is Waldner. Boll said that he wants to learn two things from Waldner: how to win so many world titles, and how to play for so long. Boll is intentionally being low-keyed. "I feel that as far as my professional career is concerned, the Paris Worlds is just one tournament. Waldner played in many Worlds, and he was not always successful", he said. Boll said that he is mainly focusing on men's singles. "I have two goals, and I have to accomplish the first one before the second. My first goal is to get into the final 4. Then I think anything can happen among the top 4 players". Facing the strong Chinese contingent, Boll said that he is not "afraid", and he emphasized the word "afraid". "I feel like I am under the magnifying glass. I have beaten the best Chinese player (Wang Liqin), and I hope that in this Worlds, I can do that again. But in the Worlds, it is normal for any of us to win", Boll said. In an interview with a Swedish newspaper, Waldner said that Samsonov, Wang Hao and Chuan Chih-Yuan are the favorites to win the men's singles title in Paris. He also said that his career will end after the 2005 Worlds in Shanghai. The two-time world champion said that his reasons are that Samsonov is playing exceptionally well this year, that Wang Hao has all-round skills and that the Chinese have high hope on him, and that Chuan has made the biggest improvements. He said that he does not expect to win any medal here, becuase he has not played for over half a year due to injuries. "However, I don't have any pressure, so maybe I can play extremely well", he said. Making Paris is one of his goals, Waldner said. He has signed a contract with Donic through 2005. His biggest goal is to make the Athens Olympics, and then finally the Shanghai Worlds. "After I retire I will still stay with table-tennis. I may consider being a coach", he said. He also said that he no longer gambles, although it was hard to cut that addiction. He mostly plays golf and soccer in his spare time. The Chinese team considers Boll and Chuan to be the biggest opponents. On May 18, we talked to Chuan at the Mercure Hotel where the Taipei players are staying. It was a short interview because Chuan was on his way to practice. On May 17, Chuan and his teammates flew to Paris from Taipei. Before the departure, Chuan appeared very low-keyed. He said that he did not expect to win any medal at the worlds, and that he was only hoping to qualify for the Olympics. The top 20 ranked players will automatically qualify (except the Chinese players). Chuan's mother, Li Kwei-Mei, who is also his coach, said that Chuan was not in the best condition, probably because he over-trained. But on May 18, Chuan said that he wants to make it to the final 4. Our reporter: "What is your goal now?" Chuan: "It is very clear: to make the final 4". Reporter: "For you, that is not a very ambitious goal". Chuan: "We are very evenly matched, and of course it would be nice if I could go further". Reporter: "Who is the most dangerous opponent for you?" Reporter: "Who is the strongest player?" Chuan: "I feel that we are all about the same, and there are 7 or 8 players who can win. For example, Boll, Ma Lin, Samsonov, Wang Hao, and Wang Liqin". Reporter: "The media calls you, Wang Hao and Boll the three young tigers in table-tennis". Chuan: "Really? They think too highly of me then". Reporter: "Among the three, who do you think is the strongest?" Chuan: "I think each of us has his strengths. Right now, Wang Hao is in really great condition". Reporter: "You think he will win?" Reporter: "Who is the most likely to win?" Chuan: "Ma Lin has the best chances". I woke up this morning to a sunny day. Birds were singing, flowers were blooming along the way from the hotel to the arena, so I was in a great mood. I was thinking that if I were to play Boll right then, I might beat him. Ha-ha. The last two days we ate at the cafeteria in the sports arena. The cafeteria is divided into two sections: Asian section and European section. The food is not particularly delicious, but the rice is welcome by most of us. In the last two days we worked on critial points, and I have not lost one match. I feel that I am doing well, although I can't say that I am happy with every point I played. I still feel tight at times, and perhaps that was due to tiredness. Even though I won within the team, I realize that this is just practice, and that we are familiar with each other's style. Only a victory in the tournament counts. I read quite a few articles on the internet about my match with Boll, and it seems like everyone wants me to be the "David" against Goliath. I know that Boll is a main obstacle to our team, and I will do my best to create the miracle. Tse Kar-Chun from Hong Kong playing against a French player.